There are simple things anyone can do to make a difference and as a business owner, you don’t need a lot of money or even time. Just look for the small opportunities to give and pay it forward all around you. In today’s episode, Khierstyn Ross and I talk about making a difference through crowdfunding. May today inspire you to see where you can pay it forward to a new startup or a cause that matters to you! Don’t forget to check out today’s challenge in the show notes. This podcast is proudly brought to you by my bestselling book: Your Brilliant Un-Career: Women, Entrepreneurship, and Making the Leap, out now on Amazon. 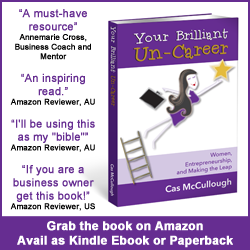 http://bit.ly/uncareerp (Paperback version) http://bit.ly/uncareer (Kindle version), and Writally.com, my new startup to help business bloggers create high-quality content in half the time. Join the beta testing community here: http://writally.com/group! Khierstyn helps project creators raise funds through Indiegogo and Kickstarter. In fact, she has raised $1.1 million cumulative between 3 campaigns. Most recently with Pavlok in Boston. She’s the host of Crowdfunding Uncut Podcast and has been on the entrepreneurship track since leaving college. When money is tight and people are cynical about giving money to big charities, it can feel hard to give or that your giving will make a difference. Yet, giving is in your nature. Neuroscience studies show that when you give to others, it releases feel-good hormones into your bodies and the atmosphere around you. Author and researcher Peter Singer identified 6 reasons why people don’t give in his book The Life You Can Save: How to do your part to end world poverty (2010). People don’t like to give to strangers. People tend to give more to causes closest to home. The assumption that someone else will take care of it. There are better tools available now to make it so that anyone can launch something online. Crowdfunding levels the playing field. Crowdfunding allows you to do a marketing campaign on a crowd funding platform and if people love your idea they can support your product. Raise money around a goal. Mentions the 4 Hour Work Week by Tim Ferris. Khierstyn’s first crowd funding campaign was a disaster but they rejigged the campaign and the second time around it was a huge success, raising $600K. We made a bunch of assumptions. We didn’t talk to people and get their perspective. We alienated a lot of people. We didn’t get enough eyeballs on the page. We had no audience to launch to. It’s important to develop your audience early. You have to start somewhere. Start building your audience now. You have to prove that people will have a need for the product you will sell. Define what you want to do with a crowd funding campaign. Next question: Why would people support something like this? Why would someone care about it? Has anyone else done what you are doing? Analyse their campaigns. Cas Mentions the crowdfunding campaign that saved the Tivoli Drive-in (a community-run driven in her hometown). Crowdfunding can help put pressure on funding bodies to back your cause and it makes them look really good so it’s win win. Khierstyn says that if she could change anything in the world, she would make entrepreneurship more attainable so people could be happier in their work life. Find an idea you like on a crowdfunding site like Kickstarter, Pozible or Indiegogo and pledge your support. It doesn’t have to be a lot, just something. Even better, tell your friends what you’re doing and support the project as a group.